How it all got started - The Metamorphosis! The first product I ever made was Be Clear Acne Balm. I was 53 and had acne most of my adult life. I applied it a few times the first day and when I washed my face the next morning I could feel the difference in my skin. My pimples were flatter. Due to the success of that product I next wanted to tackle age spots. That's when I discovered Sea Buckthorn and added it to a recipe for mature skin. As I began to use these products, I totally watched my skin go from a pimply, wrinkly, blotchy, oily sausage face, with eczema, rosacea and age spots to a radiant, youthful, nourished and healthy butterfly! People are always astonished when they learn that I'm 57!! And of course, I said... "I want EVERYONE to know and appreciate the possibilities of beautiful skin"
Now I show men and women how to take care of their skin, their body and their SELF! The BIG GOAL for Aunt Be Botanicals: We want everyone to understand and appreciate the importance of using good, quality ingredients on their skin. Most skin issues can be directly linked to the gut so we advocate clean eating with plenty of fresh greens and very little processed food and sugar. We want you to feel better about the image you're presenting to the world and that's why all of our product names use positive affirmations like Be Amazing, Be Calming, Be Rejuvenated, Be Fearless - this is how we want you to feel as you begin to heal. We support many local charities with donations of our products. 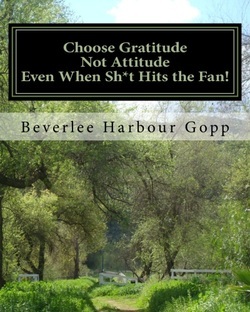 "Choose Gratitude Not Attitude Even When Sh*t Hits the Fan!" Start living the life of your dreams as you release the anger, fear and frustration and step into happiness, joy and gratitude! Do you wake up in a cold sweat unsure of what the future holds? Are you facing foreclosure, a dismal job market or feeling that you're not prepared for the golden years of retirement? Gratitude Guru, Coach Be, weaves her skills, daily stories and experience together to guide you in achieving abundant balance. This thirty day interactive journal motivates readers by sharing a daily story of inspiration followed by a list of ten reasons for gratitude. Provoking and introspective questions invite participants to determine and write out their own gratitude. Witty humor and wisdom provide coaching as a positive response to life's upside down moments.